Stevia rebaudiana (Bert.) Bertoni is a bush having its main economic and social value in its production of steviosides. The culture of stevia can be favored if young plant plugs are obtained in adequate conditions from protected environments, favorable substrates and by the use of arbuscular mycorrhizal fungi (AM). Mycorrhizas are symbiotic associations that establish themselves among the roots of the majority of vegetal species and soil fungi. As a result, mycorrhized plants are more competitive and tolerant of adverse environmental conditions than non-colonized plants. The objective of the present experiment was to select efficient species of AM fungi for the development and production of steviosides from Stevia rebaudiana. To this end, an experiment was conducted in a vegetation house to test seven species of AM fungi (Glomus intraradices, Glomus macrocarpum, Glomus etunicatum, Entrophospora sp., Acaulospora sp. ), two isolated from stevia, (CP 13 and CPVG) and a control treatment without inoculation. Vases (2L) with sterile soil were utilized and each treatment was repeated 5 times, entirely casualized. The harvest was made at the beginning of flowering, 63 days after seeding. The aerial part was dried in an oven at 45°C and the dry weight and stevioside concentration were determined. The roots were tinted for colonization evaluation. The production of dry-leaf masses was significantly superior for the treatments with G. intraradices (1.65g), G. etunicatum (1.60g) and Acaulospora sp (1.62g), while Entrophospora sp (1.23g) remained on an intermediary scale and the least efficient were CP 13 (1.00g), CPVG (0.88g) and G. macromarpum (0.56g). Control produced only 0.41g. The accumulated quantity of steviosides was significant for G. intraradices, varying from 51% in relation to Acaulospora sp. (IAC13) to 350% in relation to control. For the EM (ectomycorrhizal) total dry mass, leaves and accumulation of steviosides, no negative effect was observed for the studied fungi, G. intraradices standing out for all parameters. The colonization varied from 27% (G. macrocarpum) to 76% (Entrophospora sp and G. intraradices) and no colonization occurred for the non-inoculated treatment. The results demonstrate that the use of mycorrhizal fungi can significantly increase the production of biomass and the concentration of steviosides and that the fungi naturally established in the culture may not be more efficient for the culture’s development. Now, if the Japanese have already assessed the safety of stevia, how come we in the eu now have to jump through hoops in order to have stevia approved as a “novel food”? The rather poor photo on the left shows my first tiny stevia seedling, sown on 1st August, that emerged five days ago, and now sports its first — albeit very small — real leaves. Ungerminated seeds are visible here and there, shaming the seed bag's “Keimrate etwa 80%” (to be fair, the bag also reads “Ausreichend für mehr als 10 Pflanzen”). 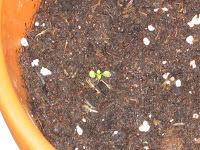 Today the Stevia seeds arrived from Germany, and for at start I have sown about one third of the seeds in a pot in my window sill. 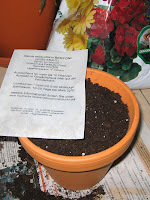 The instructions on the seed bag says that the seeds need light in order to germinate (see also this study from 1999), so I sprinkled the seeds on top of the moist soil, then covered the pot with see-through plastic to prevent the soil from drying out. See the illustrations from Medherbs. You might also like to visit Iniman's stevia blog. He started a couple of months ago, and his plants look great.